Clear Turn makes it easy to give your skin anti-aging spa treatments at home. Biodegradable paper facial mask infused with natural moisturizing Adlay Extract brightens skin tone, leaving skin moist and clear in just 5 minutes. 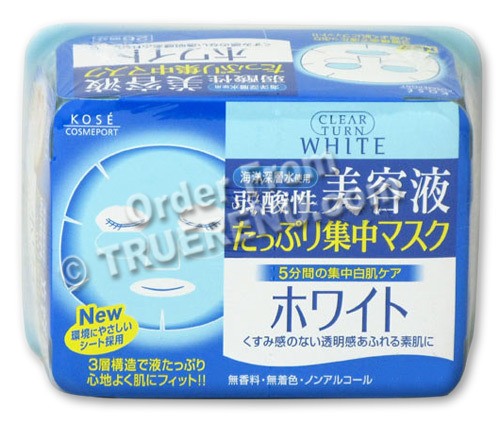 Kose's Clear Turn White Essence Facial Mask contains Adlay extract, a natural skin brightener helpful in lightening skin discolorations from aging, sun damage, and other effects. Each moist sheet has cutouts for eyes, nose and mouth. The soft mask conforms to the shape of your face, hugging the key areas around the eyes, nose and mouth. Ingredients: Water, propylene glycol, behenyl alcohol, ethylhexyl palmitate, dimethicone, cetearyl alcohol, behentrimonium chloride, orange oil, carthamus tinctorius (safflower) seed oil, hot spring water, hydrolyzed wheat protein, BG (butylene glycol), BHT (butylhydroxytoluene), disodium EDTA, PEG-45m, triethanolamine, alcohol, sodium C14-16 olefin sulfonate, citric acid, phytosteryl rice branate, hydroxyethylcellulose, polyquaternium-10, sodium lauryl sulfate, ethylparaben, phenoxyethanol, propylparaben, methylparaben, sodium benzoate, fragrance, CI 61570, CI 15510. HABA's most popular hair products in a convenient and economical set. Shampoo has high detergency and clean extremely well, while conditioner leaves your hair with a natural shine and suppleness.